Iceland Health’s Advanced Memory Formula is a nootropic supplement that claims to boost focus, aid memory function and improve overall brain health. Although this product is not the most well-known amongst nootropic customers, we don’t doubt that it can work just as well. While most nootropic supplements use herbal extracts and advanced ingredients such as Noopept or Piracetam, Iceland Health’s product relies on the use of Omega-3’s to boost brain function. Let’s see if Advanced Memory Formula is as advanced as it claims to be! The manufacturers of this product, Iceland Health, tell us to choose their company amongst others because they can provide “prompt, attentive and knowledgeable service”. When we ordered the product online, it did arrive on time and with no complications. That being said, we did not feel the need to contact the company in attempt to “test” their services. There are 30 softgels in each bottle and the suggested dose is 1 softgel a day, meaning the product is worth a month’s supply. If you buy the product via their official website (IcelandHealth.com) then the price is $34.95 but you can get cheaper deals via Amazon.com. The cost of this product is certainly under the average nootropic supplement price line, making it a good choice for those with a tight budget. However, in terms of value we feel like there are better options out there. Each Iceland Health Advanced Memory Formula softgel contains 312 of Omega-3 fatty fish oil (fatty acids, EPA and DHA included), 100 mg of phosphatidylserine and 60 mcg of boron (as boron glycinate). As you can see, the formula is very simple and mostly consists of omega-3 fatty acids. While this is not a major problem, we can see why the results we experienced were not as significant as we wished them to be. Omega-3’s can be used to promote brain health and maintain brain function. It does not, however, improve memory and focus in the same way that powerful nootropics such as Noopept do. Meanwhile, phosphatidylserine is quite a good ingredient that works to improve memory capacity and recall. A lot of customers have found that phosphatidylserine is capable of bringing successful results so good job to Iceland Health for the choice. Additionally, boron is a compound that plays a significant role in cognitive function and helps to enhance mental energy and focus abilities. 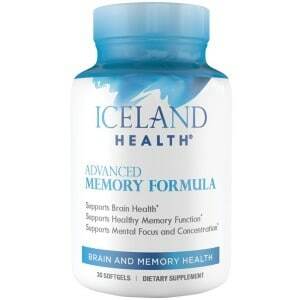 In conclusion, Iceland Health’s Advanced Memory Formula is an average product. While the formula does contain omega-3’s, phosphatidylserine and boron. We must admit that we’ve definitely seen some more ‘advanced’ nootropic concoctions. Since the supplement is quite affordable ($34.95 for a month’s supply). And, you could choose to buy it for it’s attractive price tag. However, if you’re going to spend money on a nootropic product anyway, we recommend going with the best option available. The winner of this year’s Editors’ Choice Award is Nitrovit – this product contains powerful ingredients such as Vinpocetine, Alpha Lipoic Acid and Acetyl-L-Carnitine (ALCAR), which will undoubtedly show results after just a few days of use. Don’t settle for an average product when you can treat yourself with the best!